To Cite: Moattari A, Aleyasin S, Emami A, Fyruzi M, Pirbonyeh N. The Prevalence of Human Metapneumovirus and Respiratory Syncytial Virus and Coinfection With Both in Hospitalized Children With Acute Respiratory Infection in South of Iran, Arch Pediatr Infect Dis. 2015 ; 3(3):e21581. doi: 10.5812/pedinfect.21581v2. Background: Viral infections are the most frequent causes of morbidity and mortality due to respiratory dysfunction worldwide, especially in children under five years of age. Several studies have reported the association of human metapneumovirus (hMPV) and respiratory syncytial virus (RSV) with acute respiratory infection. Objectives: The present study aimed to investigate the prevalence of hMPV, RSV, and their coinfection in children with respiratory symptoms hospitalized in Shiraz City, Fars Province, Iran. The study also attempted to determine the association between asthma and wheezing with hMPV, RSV, and coinfection with both in studied children. Patients and Methods: The study included 280 younger than five years old children with non-influenza infection that were hospitalized for respiratory infection from 2011 to 2013. Nasopharyngeal swabs were collected from patients and tested for RSV and hMPV with reverse transcriptase polymerase chain reaction. Results: The hMPV and RSV were detected in 44 (15.7%) and 84 (30.0%) samples, respectively. Coinfection with both viruses was found in ten patients (3.57%). The incidence of hMPV and RSV infections were observed in children younger than one year old. Infections occurred predominantly from October to April. The most common clinical symptoms were bronchiolitis, wheezing, and cough. Conclusions: Infection with hMPV and RSV are most frequent infections among pediatric patients with respiratory tract symptoms. Coinfection with these viruses may exacerbate the clinical symptoms and increase hospitalization rates, especially in children younger than one year old. Different studies showed that wide range of viruses such as Adenovirus, Coronavirus, Influenza viruses, respiratory syncytial viruses (RSV), and human parainfluenza viruses are associated with respiratory disease in humans (1). Over the last decade, van den Hoogen et al. reported the isolation of a novel virus in young children with acute respiratory tract infections (2, 3). This virus was classified in the metapneumovirus genus of the sub-family Pneumovirus, family Paramyxoviridae of the order mononegavirales and was given the provisional name of human-metapneumovirus (hMPV), which can infect people in all age groups (3-5). Since then this virus with other respiratory tract viruses, a new human polyomavirus (bocavirus) (6, 7), and two new coronavirus types (5, 8) are introduced as the main causes of respiratory tract infections in human, especially children. In recent studies, viruses including influenza viruses and RSV have been frequently detected in samples obtained from patients with lower respiratory tract infection, especially in pediatric patients. It has been showed that viruses, alone or together with pathogenic bacteria, are responsible for respiratory tract infections where viral infections are the most substantial causes of morbidity and mortality in respiratory dysfunction, especially in children under five years old (1, 9). Viruses are potential etiologic agents of pneumonia, wheezing, and asthma in children. The association of hMPV with asthma exacerbation has been reported in several recent studies (9, 10). In addition, wheezing is a common symptom manifested in children infected with hMPV (9, 11). These studies have shown that infection with hMPV, which was identified in upper and lower respiratory tracts of patients, can lead to bronchiolitis, bronchitis, and pneumonia (3, 11). RSV is another important respiratory pathogen of childhood (70 - 85% of cases) during winter epidemics, especially in hospitalized children (12). The recent infection causes severe lower respiratory tract infections such as pneumonia or bronchiolitis in young children (13). Phylogenetically, RSV is the closest human virus to hMPV and coinfection with these two viruses in children suggests exacerbating bronchiolitis. Moreover, hMPV shares an overlapping spectrum with RSV and therefore, they cannot be distinguished by clinical manifestations (13, 14). RSV and hMPV might have similar seasonal patterns; hence, their coinfection is possible and must be discriminated by especial laboratory tests (13, 15-17). During the outbreak and increasing the respiratory problems during 2011 - 2013, especially in pediatric wards affiliated with Shiraz University of Medical Sciences, Shiraz City, Fars Province, Iran, this study was designed to investigate the etiologic agents and their roles in children under five years of age who had negative results for influenza virus with emphasis on hMPV and RSV. In addition, we tried to evaluate the coinfection of these two viruses with clinical manifestation of respiratory illness. During fall, winter, and spring of 2011 to 2013, samples of nasopharyngeal swabs were collected from 435 hospitalized children with less than five years of age. They were referred to medical centers due to acute bronchiolitis, wheezing, coughs, or other signs of respiratory distress while some patients had history of acute asthma. Each swab was expressed/transported in a microtube containing 200 μL of phosphate buffer saline (PBS). Samples were finally stored at 80°C until used. RNA was extracted using Roche pure viral nucleic acid kit (Roche, Berlin, Germany). In the first step, to exclude the influenza virus infection from the study, extracted RNAs were screened for common circulating influenza viruses with a homemade Real-time polymerase chain reaction (RT-PCR). In remaining 280 specimens that were negative for Influenza viruses (64.36%), prevalence of hMPV and RSV was evaluated by PCR. To assess RSV, RNAs were reverse transcribed by cDNA synthesis Kit (Fermentas Inc, Germany); then glycoprotein (G) gene was amplified by nested PCR using pairs of primers (Table 1). In addition, fusion (F) gene of hMPV (conserved regions among Dutch and Australian) was amplified by primer pair demonstrated in Table 1 by one-step PCR reaction (18, 19). a Abbreviations: RSV, respiratory syncytial virus; and hMPV, human metapneumovirus. The polymerase chain reactions for RSV detection were performed with the following mixture. For the first amplification step, the reaction mixture was made up to final volume of 50 μL containing 1 × PCR buffer (Cinnagen, Tehran, Iran), 0.2 μM of each dNTP, 1 μL of 10 ρmol/μL of each primer, 1.5 U of Taq polymerase, 1.5 μM of MgCl2, and 5 μL of cDNA. The reaction mixtures were amplified in a thermal cycler (Eppendorf Inc, California, the United States) with the program presented in (Table 1). In the nested PCR, 3 μL of the initial reaction product were added to reaction mixture containing the same reagents as the first round PCR. Negative control (non-template control) was included in each run and results were assumed valid only if all negative controls showed no band in electrophoresis step. PCR results were accepted as positive when a clear band was detected at the expected sizes. PCR products with 281 bp for hMPV and 326 bp for RSV were indicative of positive result as analyzed by electrophoresis on 1.5% agarose gel. The data were analyzed by χ2 test using EPI-Info 2000 and SPSS 11.5 (SPSS Inc, Chicago, Illinois, the United States). P values < 0.05 were considered statistically significant. A total of 280 children with respiratory dysfunction and clinical manifestation of bronchiolitis, wheezing, cough, and fever with/without history of asthma, who had negative results for influenza viruses, were examined for h-MPV and RSV viruses. All patients presented with bronchiolitis, wheezing, and cough symptoms. 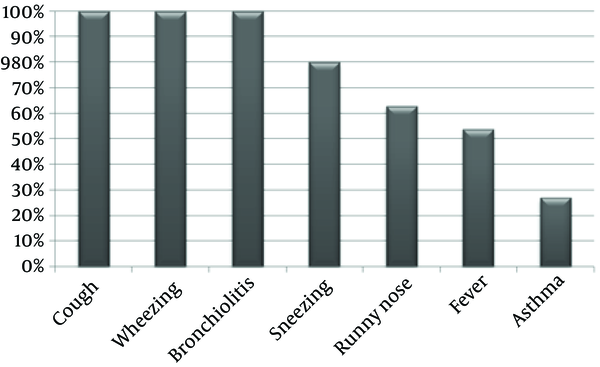 (Figure 1) while some of them exhibited fever or runny nose. The hMPV and RSV were detected in respectively 44 (15.7%) and 84 (30.0%) of 280 children. Some patients had both viruses simultaneously (10 patients [3.5%]) (Figure 2). This study showed that both hMPV and RSV were associated with clinical signs of bronchiolitis exacerbating pneumonia and asthma. Among 28 patients with asthma, RSV and hMPV were present in13 (46.4%) and 7 (25.0%), respectively. Coinfection with both hMPV and RSV among patients with asthma was determined to be 10% (1 out of 10) that was not significantly different from those without asthma (P = 0.29). Clinical records also demonstrated that hospitalization period became prolonged with increase in oxygen requirement in hMPV and RSV coinfection. The mean age of children with positive results for hMPV and RSV was 11 ± 0.5 months (range, 35 days to 60 months). The age distribution of hMPV and RSV positive children is shown in Figure 3. A higher incidence of hMPV and RSV infections was observed in children younger than one year (P = 0.0025). 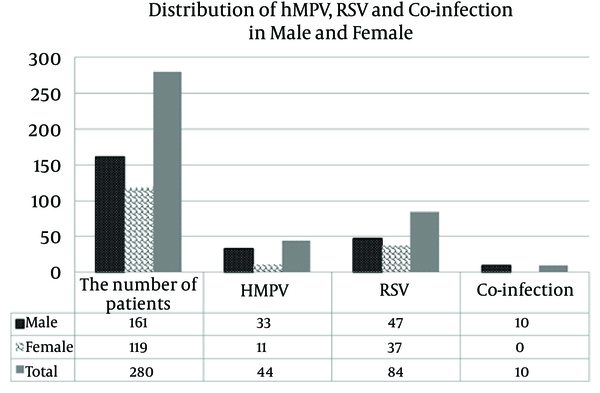 Statistical analysis showed an insignificant correlation between an hMPV and hRSV infections and hospitalization of more than five days (P = 0.727 for hMPV; and P = 0.093 for RSV). According to our clinical data, infections due to hMPV and RSV were more prevalent during October to April. The age of patients was under five years (161 males and 119 females). Viruses are potential etiologic agents of pneumonia, wheezing, and asthma in children (7, 8). The present study included 280 children with non-influenza infection with the age range of 35 days to 60 months and pulmonary distress. Infection with RSV, as most impressive respiratory virus of childhood, leads to some pulmonary symptoms. The most common clinical manifestations in our patients were cough, wheezing, and bronchiolitis (100%), while other signs such as fever, sneezing, and runny nose rate were seen in 50% of patients (Figure 1). It was confirmed previously that RSV is the most frequent pathogen in children with bronchiolitis and wheezing (20). Some of the patients with RSV infection also developed asthma (47.0%). The causal mechanisms behind this etiology are unclear. It is believed that genetic factor play an important role. The genetic polymorphisms of cytokines, chemokines, and difference in cytokine expression may be associated with diversity in clinical manifestation. As shown in Figure 2, RSV was detected in 84 patients (30.0%) (47 males and 37 Females), which was in agreement with the findings of similar studies (21, 22). Recently, a retrospective review of the medical records of children ≤ 2 years of age with acute bronchiolitis between January 1995 and December 2006 was published. The results showed that among 2384 patients hospitalized for acute bronchiolitis, 1495 (62.7%) were infected with RSV (22). In another study performed on 455 cases in Brazil, the prevalence of RSV was reported to be 49.3% (23). From epidemiologic point of view, RSV infection is more prevalent during November to March (22). According to our study, RSV infection was detected mostly around October to April and winter-spring seasons, while in another study, it was reported to occur during July to October (24). The bronchiolitis caused by RSV seems to be more severe than that caused by other viruses (22). In our study, infection with hMPV was detected in 44 children (33 males, and 11 females) (15.7%) (Figure 3). In China, the prevalence of hMPV was reported to be 6.8% among children between 29 days and nine years of age (25). In previous study, we detected hMPV in 16.6% of children with wheezing and asthma in Shiraz City, south of Iran, which showed that hMPV as an important viral cause of acute wheezing in hospitalized children (26). However, the prevalence of hMPV among children with lower respiratory tract infection was reported to be 14.5% (23). Caracciolo et al. showed that the incidence of hMPV infection was 25.3% during winter-spring seasons of 2005 - 2006 (27), a finding that was supportive of our results. Peiris et al. reported that the patients with hMPV tend to have a longer hospital stay of more than two days (28). Our results indicated that those infected with hMPV might have a longer duration of fever and hospitalization than those infected with RSV and influenza viruses (29). The hMPV/RSV coinfection is frequent and could be more severe than infection by either virus and is marked by increased hospitalization rates (26, 30, 31). The prevalence of coinfection by RSV and hMPV in our study was 3.5%, whereas it was reported to be 4% in a study from Yemen (17). It was also indicated that hMPV and RSV might act in concert to potentiate their pathogenic effects and exacerbate the clinical symptoms of the respiratory disease (32). The average age of the patients in our study was 11 months (Figure 3), which was similar to that of the study by Mullins et al. (33). A high incidence of hMPV and RSV infection was observed during winter-spring seasons of 2011 - 2013, which was consistent with that of another report (27). However, according to Akinloye et al. the circulation of these viruses was mostly observed in dry seasons, which can be explained by geographic variation (34). Furthermore, the prevalence of RSV and coinfection in males was greater than that of females (Figure 2). 1) Infection with hMPV and RSV viruses are prevalent in hospitalized children with respiratory distress; 2) They play major role in appearance of some clinical manifestations including bronchiolitis, wheezing, and cough; 3) Infection with RSV is more common than infection with hMPV; 4) children of < 1 year old experience more severe disease due to these agents and need hospitalization; finally, their coinfection may exacerbate the clinical symptoms and increase hospitalization rates, especially in young children; however, more samples are need to conform these findings. We would like to thank the Ethics Committee of Shiraz University of Medical Sciences for approval of this project. Funding/Support: This study was financially supported by Deputy Chancellor of Research, Shiraz University of Medical Sciences (Grant number: 89-01-01-2353).